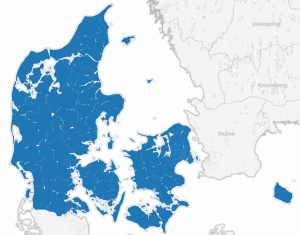 Tableau is not equipped with the regions of Denmark, but the following can be a suitable alternative while we wait for Tableau to support Denmark natively. 2) Make a live connection to the Excel file from Tableau. 7) Drop "Polygon number" and "Name" on the detail shelf. Do you want to know more about drawing your own graphs then watch this excellent traning video on the topic. 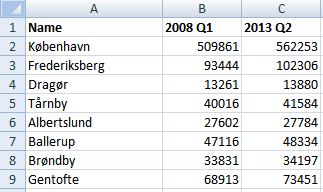 1) Download this dataset that holds the population of the danish regions for 2008 Q1 and 2013 Q2. 2) Connect live to the excel workbook from Tableau and note that the field names are connected with the field "name". 3) Drop the field 2013 Q2 on the color shelf and you will see which regions are the most substantial measured by population. I used the data to build a visualization of the danish population drift (download the workbook from here as well). 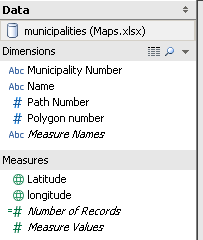 How did I build the dataset containing the geo-information for the regions? To obtain all the dots connecting the regions in Denmark I used the danish geo-service geo.oiorest.dk. I wrote a small PHP script that fetched all the regions and then crawled the coordinates from each region into a MySQL database. That gave me not less than 1.2 mio. dots. To improve performance I reduced those to 74.000 dots (and it can possibly be reduced even more without loosing to many details).